Dickey Lee was born in Memphis, Tennessee, in 1936. 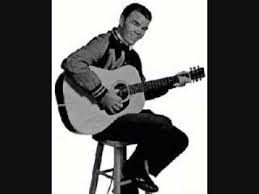 In 1957 he recorded “Dream Boy” which was a #2 hit on the Memphis pop music stations. With that success he got signed to Sun Records. In 1962 he wrote “She Still Thinks I Care”, which was a hit for George Jones. Lee was signed to Smash Records and at the age of 26 had a #6 hit on the Billboard Hot 100 with “Patches.” The song about teen suicide was banned in various markets and was not playlisted on CFUN in Vancouver. He had another song about a girl named “Laurie” who died a year before her ghost asks for a teenage boy’s sweater. Most of his songs in the 1960’s had a tragic side to them. Like a lot of American recording artists, after the British Invasion it was getting much harder to have a hit single on the pop charts. The Beatles, The Dave Clark Five, Herman’s Hermits, The Animals, The Searchers, Petula Clark, Dusty Springfield, Peter & Gordon, Freddie & The Dreamers, Gerry & The Pacemakers, The Hollies, The Rolling Stones, The Kinks, The Zombies and others were elbowing many American pop stars out of the Top Ten and even the Top 40. Dickey Lee’s last Top 40 hit was “I Saw Linda Yesterday.” And that was back in 1962. He tried to get listeners to AM radio to tune in to “Big Brother”. 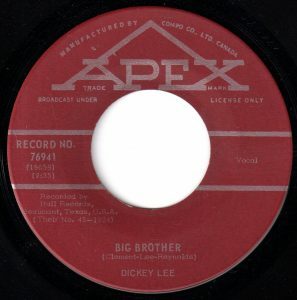 “Big Brother” was a song Dickey Lee co-wrote in 1964. It was first recorded by country star Tex Ritter. Lee recorded the song in early fall 1964 and it appeared on local charts in Houston and elsewhere in mid-October. It peaked just below the Billboard Hot 100 at #101. The song was part of a teenage theme from the early rock era concerning a friendship between a boy and a girl several years apart in age from their childhood. Like “Born Too Late” by the Poni-Tails and “Wait For Me” by the Playmates, “Big Brother” detailed the dynamics of two people born a few years apart. Teen listeners were keen to pick up on the differences between ages, especially when it was not common to pal around with people in school who were more than a grade above or below you. In the song, Big Brother is a ten year old and the girl is a seven year old. They had tea together, made mud pies, accompanied each other to the fair, and eat candy. She assures her mother that her big brother will take care of her. When she turns 18, the 21-year-old “Big Brother” starts to notice her. He finds her attractive and thinks about making her his wife. But in a classic lyric about timing, instead she breaks the news to him that she’s about to be wed. And the groom isn’t him. Vancouver listeners sent “Big Brother” to #7. Elsewhere, “Big Brother” climbed to #1 in Louisville (KY), #2 in Erie (PA) and Hamilton (ON), #3 in Des Moines (IA), #6 in Houston, #7 in Columbus (OH) and #8 in Las Vegas. But with The Beatles, Righteous Brothers, The Supremes, The Beach Boys, Bobby Vinton, The Impressions and Little Anthony & The Imperials all crowding the Top Ten, “Big Brother” didn’t get on many other playlists across North America. Over the years, Dickey Lee has had his compositions recorded by Cher, Sam The Sham and The Pharaohs, Dee Jay and The Runaways, The Olympics, Del Shannon, The Rip Chords, Jerry Lee Lewis, Dino, Des & Billy, Marty Robbins, Sonny James, Hank Locklin, Glen Campbell, Kenny Rogers, Anne Murray, Ivory Joe Hunter, Waylon Jennings, Leon Russell, Charlie Pride and others. Dickey Lee turned his attention to country music by the end of the decade, moving from Memphis to Nashville. In the 1970’s he had three top ten country hits. One of these, “Rocky”, was a cover of the Austin Roberts pop tune. Lee took “Angels, Roses and Rain” to #1 on the Country charts in Canada. He also had success with “9,999,999 Tears”. In 1976, Dickey Lee was nominated for a Country Music Award and a Grammy nomination for Country Song of the Year for his recording of “The Door is Always Open”. A version of the song by Dave and Sugar went to #1 on the US Country charts. Lee continues to perform concerts on occasion. He is 81 years old. Dik, Dickey Lee bio, Rockabilly.nl, June 2014.